under new laws in ATo publication ‘rental properties 2018’:for contracts after 9th May 2017 there is no more depreciation for second hand plant assets in residential rental properties purchased for deriving rental income only unless the property is used for conducting a business including a rental property business or you are an excluded entity. if you rented the property after 9th May 2017 having purchased it earlier then no second hand assets can be depreciated. I have often been asked whether property investors in property built on leased land are entitled to depreciation on that property. The ATO has ruled that lessees of land that hold a depreciating asset that is fixed to leased land are the holders of those assets for the time they have the right to remove those assets. Hence, as the holders of those assets they have the right to depreciation on those assets. If a lessee or owner of certain other rights over land eg. an easement improves the land with a depreciating asset that person is the holder of the asset if the asset is for their own use even though they have no right to remove it from the land eg an asset like an irrigation system on a farm. They remain the holder for the time that the lease or right exists. 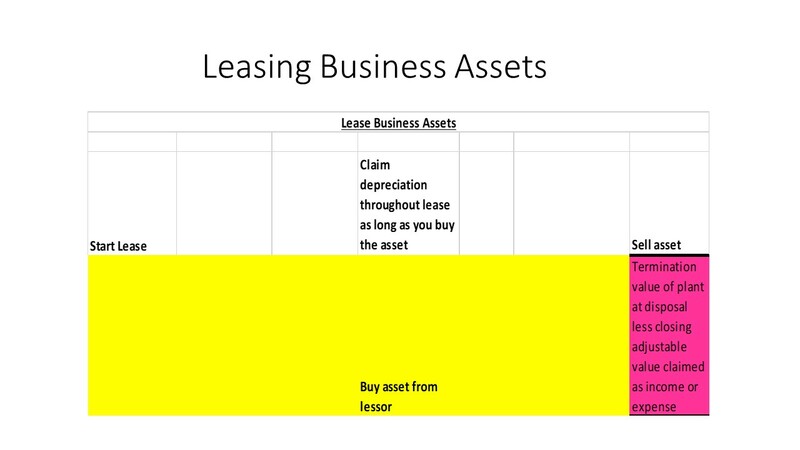 Hence, as the holder of the asset the lessee can claim depreciation on that asset. Starting from budget financial year 2019-2020 small business assets below the value of $30,000 will qualify for an instant write-off. The new instant write- off will apply to any number of assets bought below the value of $30,000 but any purchases above $30,000 will be depreciated under the single pool at a 30% rate. Newly acquired assets over $30,000 are deducted at 15% (half the pool rate) for the first income year. Starting from the 2012-2013 financial year small businesses will also be allowed to depreciate most other assets in a single pool at a 30% rate. The long life pool no longer exists. If you had a long life pool its closing balance is rolled over to form part of the opening balance of the general small business pool for the 2012-2013 financial year. 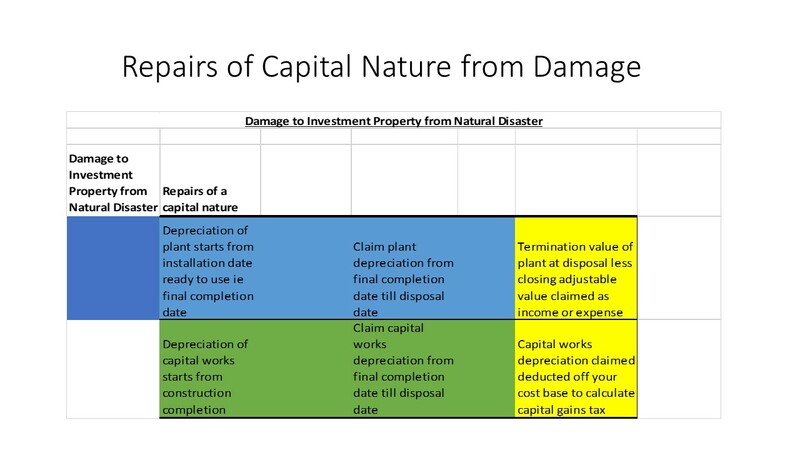 The repair or replacement of damage a natural disaster causes to a rental property or tangible business assets affects the expenses you can claim & the income you need to report for rental properties but insurance payouts for work related items or houses used as business premises is not taxable. These insurance payouts don’t have to be included as income in your tax return. If the destroyed asset was a depreciating asset then an insurance payout less the closing adjustable value of the depreciating asset at it’s time of destruction is then treated as income or as a deduction in your tax return depending on whether the insurance payout was greater than the closing adjustable value (which is income) or the insurance payout was less than the closing adjustable value (which is a deduction). (A depreciating asset is an eligible asset under current ATO legislation that is used in the production of income either in a business or a rental property). Where a depreciating asset was destroyed/loss by a bushfire then you may be able to offset any amount of assessable income from an insurance payout with the cost of replacing that asset. The destruction or loss of an asset is an involuntary disposal of a depreciating asset in which the balancing adjustment amount such as income where the insurance payout is greater than the closing adjustable value is offset against the cost of acquiring one or more replacement assets. For depreciating assets used wholly or partially for private purposes then the percentage use of that asset for private purposes expressed as a percentage of its total value is treated as a capital gain (insurance payout greater than its private use percentage of total value) or capital loss. An insurance payout for damaged or destroyed houses that were not only ever used as a principal place of residence need to be taken into account for Capital Gains Tax (CGT)purposes. If the house was only ever used as a principal place of residence there is no CGT applicable. If you used the house as a rental property then the insurance payout has to be deducted from the cost base ie. what you originally paid for the house less any capital works deductions (Division 43) claimed during income production years to calculate CGT. You can claim deductions for repair to property where it is tenanted or genuinely available for rent. For the cost of repairs to be an allowable deduction your property would have to be rented out immediately prior to repairs being needed & the damage being repaired would have to have occurred during the rental period. Cost of repairs to rental properties can be claimed as deductions providing you do not have to re-build or replace an entire structure which is identified as a separate item of capital equipment like a fence, stove, kitchen cupboards or a refrigerator. This means you cannot claim the entire replacement cost in the year it was incurred but you may be able to claim the cost over a number of income years as a depreciating asset deduction (Division 40 plant) or capital works deductions (Division 43). An improvement of the asset that is new, improves the income generating ability of the asset & is not a mere like for like replacement of that asset can also be claimed as a depreciating asset deduction or capital works deduction. If you receive an insurance payout for these repairs then this is treated as assessable income. A repair to depreciating assets in a rental property is an allowable deduction. For example if you just repair carpet damaged by flood you can claim a deduction for the repair. If you replace that whole flood damaged carpet then you can claim a deduction for the closing adjustable value of the carpet that was removed and depreciation on the new carpet. Initial repairs for example remedying defects, damage or deterioration that existed at the date you acquired the property are regarded as capital expenditure & can be claimed as capital works deductions.